We are very pleased to have been recognized on the world stage with a trio of trophies recently awarded at highly regarded international wine shows in Europe and Asia for our Chardonnay and Pinot Noir wines. The AWC International Wine Competition in Austria is the largest recognised wine show in the world and this year saw 12,402 wines entered from 1,716 wine producers in 39 countries. At the presentation ceremony in Vienna, we were awarded the trophies for ‘Best White Wine of Show’ as well as for ‘Best Chardonnay up to 12.9% Alcohol’ for its limited release 2016 Bream Creek Reserve Chardonnay. Winning these two Trophies – including the ‘Best White Wine of Show’ at the largest international wine show in the world is quite incredible! Chardonnay is sometimes overlooked in Tasmania, given the popularity of Pinot Noir, but this recognition reinforces my view that Tasmania does indeed produce world class Chardonnay. We have also received recent recognition for our Pinot Noir. At the 2018 Hong Kong International Wine & Spirit Competition, the 2016 Bream Creek Reserve Pinot Noir (not yet released) was awarded the trophy for ‘Best Pinot Noir’ while at the 2018 Decanter Asia Wine Awards the 2016 Bream Creek Estate Pinot Noir won a “Platinum Best in Show” Medal. These results in international competitions provide a strong endorsement of the great quality of the wines we are producing in Tasmania. There is no doubt that the combination of Pinot Noir, Chardonnay and the Tasmanian climate is the envy of many Australian and International wine producers. 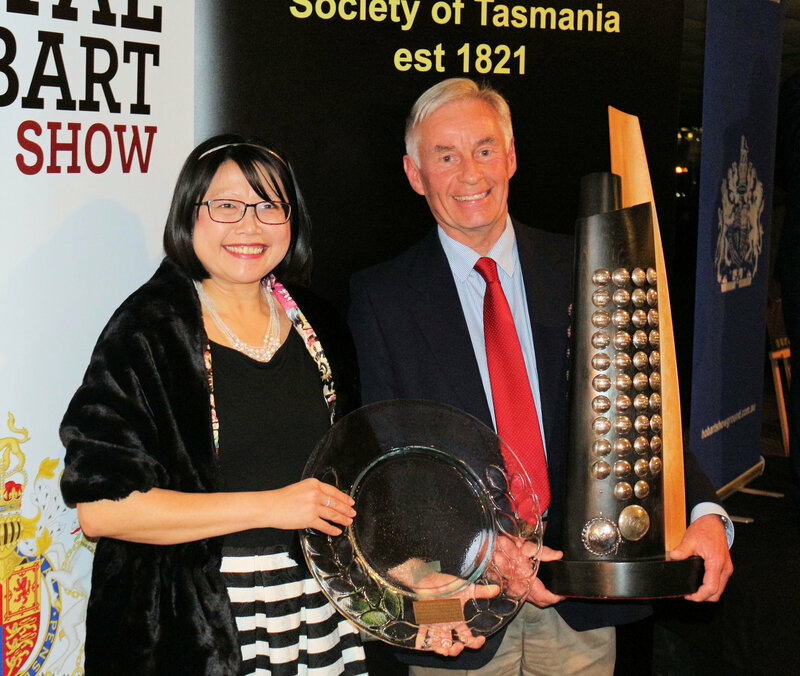 We were delighted to be presented with two trophies at the 2018 Royal Hobart Wine Show a little while ago. As you may be aware I am a firm believer that Tasmania produces world class Pinot Noir wine – so was very pleased that our trophies were for “Best Tasmanian Red Wine” as well as “Best Tasmanian Wine” for our 2017 Estate Pinot Noir! The Tasmanian wine industry continues to go from strength to strength, and I feel privileged to be part of it. We expect to release this wine around the middle of 2019. And yes, I can confirm that the large trophy on the right hand side of the photo (being for “Best Tasmanian Wine”) is at least as heavy as it looks! Being awarded “Best Tasmanian Winery” at the 2018 Melbourne International Wine Competition. Double gold medal for our 2016 Reserve Chardonnay and gold medals for our 2017 Chardonnay, 2017 Riesling and 2016 Reserve Pinot Noir at the 2018 Asia Wine & Spirits Awards. Gold medals for our 2015 Reserve Pinot Noir and 2016 Reserve Pinot Noir at the 2018 China Wine & Spirits Awards. Gold medal for our 2016 Reserve Pinot Noir at the 2018 Sydney Royal Wine Show. 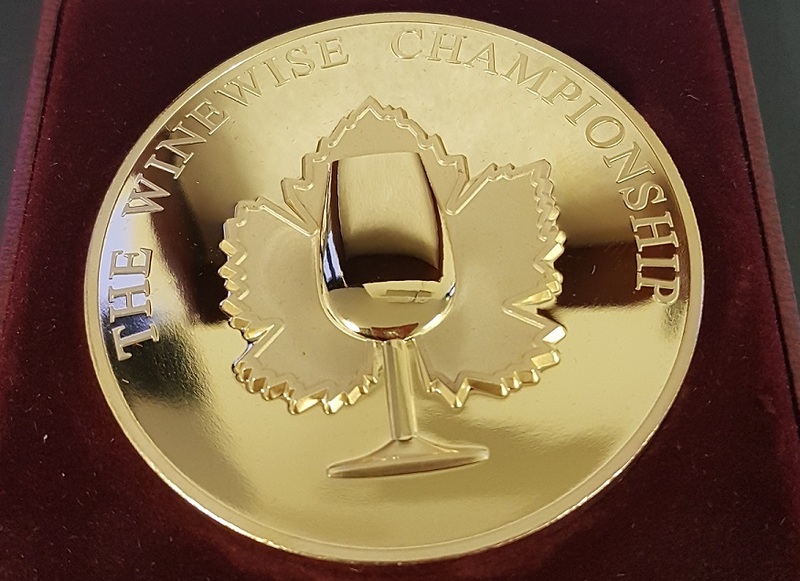 Gold medal for our 2016 Reserve Pinot Noir at the 2018 WineWise Small Vigneron Awards. The 2016 Reserve Chardonnay and the 2015 Reserve Pinot Noir are both currently available – the other wines are due for release in 2019. You can purchase any of our current release wines via our secure online shop here – remember that you can mix and match and the minimum order is only 6 bottles. As the vines begin to wake up…. Following a very early start to budswell, the vines have slowed a little over the last 3 weeks – which is great! But warmer, and in the south and east, drier conditions are seeing chardonnay showing green tips and most other varieties are well and truly on the move. Cabernet, Merlot and Sauvignon Blanc however, still look a little sleepy. The exceptionally dry conditions in the south east – especially in the Derwent and Coal Valleys and on the East Coast – are somewhat concerning. Our main dams are very low but we are fortunate in being able to transfer water from a reserve dam, and also to get access to some scheme water, which we will need to start drawing in the next week. Very dry springs also traditionally carry an increased risk of late spring frosts, which in some blocks can be quite damaging. Most of our blocks have a very low risk factor, but never the less we shall be monitoring the situation closely. Our stately old riesling vines at Bream Creek are now commencing their 45th spring – so I guess they have seen wetter and drier seasons before and simply take it pretty much in their stride! 95 points for each of our 2015 Estate Pinot Noir (“A long and prosperous future awaits”), our 2016 Riesling (“impeccable balance…extra level of depth“) and our 2016 Estate Chardonnay (“effortless display of variety and of place“). 94 points for our 2011 Cuvée Traditionelle sparkling (“follows in the fruit footsteps of the gold medal winning 2010“), our 2016 Reserve Chardonnay(“distinctly greater weight and complexity“) and our 2017 Pinot Rosé (“a striking wine“). As the vines take their winter nap…..
We are very pleased to announce the release of our two Pinot Noir wines from the 2015 vintage – our 2015 limited release Reserve Pinot Noir and also our 2015 Estate Pinot Noir! More details on each of these wines are below…. 2015 Reserve Pinot Noir As we have mentioned previously, this wine was awarded the Medallion (Trophy) for “Best Pre 2016 Pinot Noir” at the 2018 WineWise Championship which is an invitation only event exclusively for wines that have already been awarded a gold medal in a selected list of wine shows. The judges commented that our 2015 Reserve Pinot Noir was “Full flavoured and substantial” and “definitely one to cellar”. It also won gold medals at the 2018 Tasmanian Wine Show and the 2017 Royal Melbourne Wine Show. This is a complex and powerful wine, fragrant aromas of dark cherry, blueberries and violets flowing onto a palate showing intense flavours of dark cherry and raspberry, matched by subtle tannins. With excellent length and balance this limited release wine can be enjoyed now, yet will also reward careful cellaring, and is substantial enough to match rich beef dishes such as Cape Grim beef cheeks. More details of this wine can be found here. 2015 Estate Pinot Noir We are very proud that this wine was selected late last year as one of only six Southern Hemisphere 2015 Pinot Noir wines to take part in the invitation only 2018 Stonier International Pinot Noir Tasting. This tasting pits the best Pinot Noir wines of the Northern Hemisphere against the best from the Southern Hemisphere in a blind taste off in Sydney for the elite of the wine industry, including wine writers James Halliday, Huon Hooke, Peter Bourne, Max Allen and Gary Walsh. While we don’t have reviews from all these wine writers (we expect James’ review to be in his 2019 Wine Companion, to be released in August) both Huon and Gary have published reviews. Huon awarded this wine 95 points, commenting “Full-bodied, fleshy, dense and high-extract. A big wine, with lots of persistence…” while Gary awarded it 94 points, writing that the wine showed “Dark cherry, spice, earthy minerally stuff, bit of oak. Fleshy graphite tannin, slight tang to close, length and power. Flamboyant, but very good”.” Made in our traditional fuller bodied style, this cool climate Pinot Noir has a spicy dark cherry nose and an intense dark fruit palate, supported by fine grained tannins. This wine may be enjoyed now or confidentially cellared and you can’t go past the traditional roast duck as an excellent foods match. More details of this wine can be found here. You can purchase these wines via our secure online shop here – remember that you can mix and match and the minimum order is only 6 bottles. Finally, a comment on stock levels. The fruit from the 2015 vintage was of excellent quality, with perfect balance between flavour and physiological ripeness – however, yields were significantly down across all southern Australian states, including Tasmania, and so we expect this wine will will sell out well before Christmas. Bream Creek is Out and About in June and August! Get your calendar ready, as the Bream Creek team is going to be out and about in June and August. In June we are taking part in the annual Dark Mofo event! Yes, you will find us at Winter Feast inside PW1, on the Salamanca side (Stall 38). We’ll have a selection of our wines available for purchase by the glass or bottle – including our multi gold medal winning 2014 Estate Pinot Noir. Winter Feast will be on 15-17 June and also 21-24 June, from 4pm each of those days. Don’t forget to pre-order your “Season pass” tickets here – otherwise tickets can be purchased on the door each night and entry is free after 8pm each night. In August we are once again appearing in Sydney and Melbourne for the annual VIN Diemen festival. The dates are Sydney on Saturday 11 August and Melbourne on Sunday 12 August. While the Sydney event is scheduled once again to occur at the Cell Block Theatre in Darlinghurst, the Melbourne event is a little different this year – it will be a more intimate event, presented at Pure South Restaurant, which will mean the onsite Tasmanian food offering will be first class. The event will be officially launched in mid-June – but “Early bird” and “VIP” tickets are already available at this website. Last month we released our two Chardonnay wines from the 2016 vintage – our 2016 limited release Reserve Chardonnay and also our 2016 Estate Chardonnay. Chardonnay sometimes doesn’t gain the recognition that Pinot Noir does in Tasmania – but that is slowly changing. We were very happy to be awarded gold medals for each of our 2016 Reserve Chardonnay and our 2016 Estate Chardonnay at the 2018 International Cool Climate Wine Show! The judge’s comments on each of these wines is in the “Awards” section for each wine. You can purchase these wines via our secure online shop here – remember that you can mix and match and the minimum order is only 6 bottles. Vintage 2018 is remarkable not just for the “compactness” of ripening across different varieties and sites, but also the amazing quality of the grapes and the stunning performance of the vines. Picking started quite early at the beginning of February, and except for one day on which we couldn’t pick because of showery weather, we hand – picked continually until late April, when we concluded vintage with our Cabernet Sauvignon and Merlot. Yes, there is a tendency for vignerons to talk up just about every vintage! But quite seriously, this vintage reminds me of the fabulous 2005 vintage – which, until this vintage, I regard as the best I have ever experienced in Tasmania. Fruit quality was sensational – clean, full flavoured and despite the long warm weather, it did retain its Tasmanian attribute of refreshing, balanced acids, avoiding the “dullness” that can occur through excessive heat. We had no problems with disease or insect damage, and strangely even the birds were fairly quiet. Silver (White) Eyes seemed to stay further south and clear of the vineyards and we hardly saw any flocks of starlings. The vines handled the higher fruit loads with ease, which I attribute to the generally dry winter and spring enabling the survival of the deeper roots ready for the summer. So all in all, a most rewarding – even enjoyable (!) vintage 2018. We shall keep you posted on the progress of the wines.…. More Success for our 2015 Reserve Pinot Noir! Vintage 2019 – Nearly There….